Finished product! Rolled in deliciousness & in tiny cupcake sleeves. Veteran’s Day Weekend McSweeney & I went to visit some dear friends we haven’t seen in way too long, AKA years! John (JB) & Patty Snyder are officially the definition of Southern Hospitality!! And, being University of Louisville grads, naturally our weekend included a home game, hence the name of the post. "Go Cardinals!" JB & Patty introduced us to a bunch of special things in Louisville but, our favorite was touring the Kentucky Bourbon Trail. Yup! That’s totally a thing! Imagine a wine tasting in Napa, only tasting Bourbon in Kentucky! You may need to sit with that for concept for a minute, took me a few, LOL.. Turns out there are all sorts of things you can cook with Bourbon. The pork tenderloin marinade recipe also sounded delicious but, it’s the holiday season so, we're starting with the cookies! “Bourbon Balls,” to be exact! 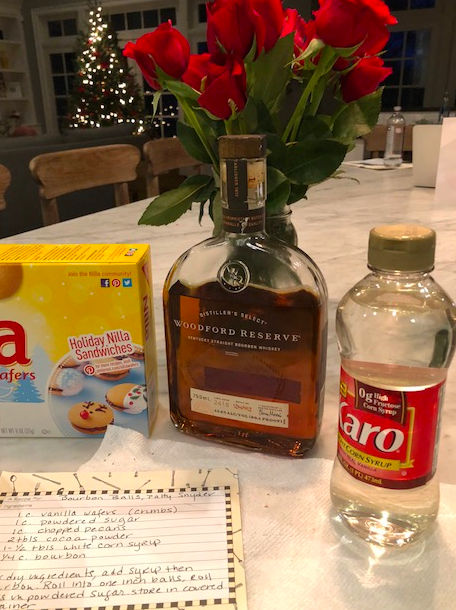 In addition to teaching me about birds, decorating Christmas trees and tailgating with old friends, Patty was kind enough to share her Bourbon Ball recipe with me - on a real recipe card! 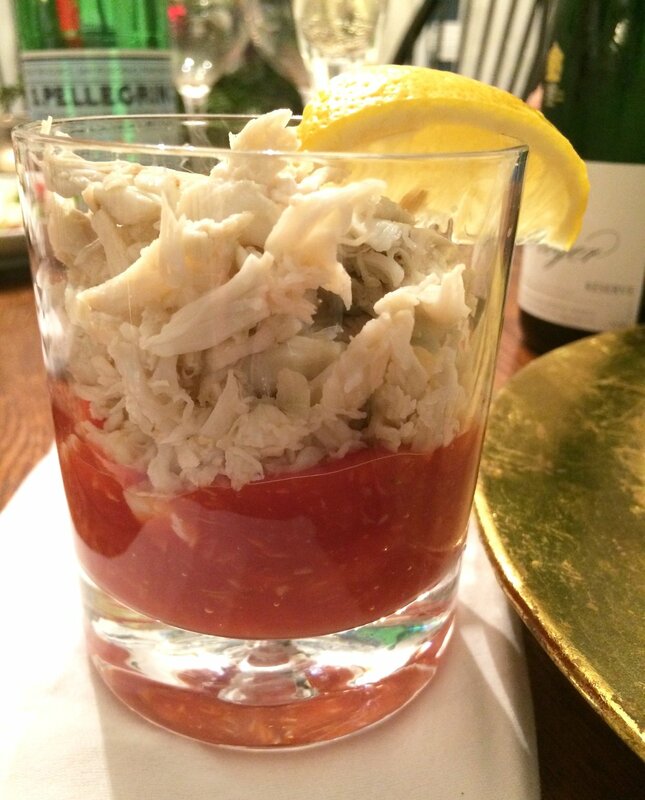 This one is super easy, folks and so delicious, we had to share it with all of you just in time for the holidays! Complete with Patty's recipe card! Mix all together in a bowl with your hands, should feel a little sticky. Roll into balls a little larger than the size of a malted milk ball and store in an air tight container in your fridge until you're ready to serve. Just before you serve, roll them into the topping you love the most. Patty uses confectioners sugar so, we started with that. In addition to the pretty sugar topping, we used flaked coconut and cocoa powder, yum... Serve in teeny tiny cupcake holders. My husband and I make bets against one another. You know, to keep things spicy. (insert eye roll and pun intended!) Anyway, we're betting who can lose 15 lbs by Thanksgiving. Don't tell him, but I'm not exactly in weight loss mode right now (yoga = body acceptance and ultimate bliss - try it!) So, ssshhhh! I'm letting him win. I do find that when I am in actual weight loss mode, soup is a key element towards success. Like most commuters, I come home from work ready to eat the front door. The hours between 6-8PM can be a danger zone, but soup can be a life raft to get you safely through; away from the Halloween candy. While you are getting out of your work clothes, yelling at the kids to finish homework, getting the dog fed, emptying back packs, etc. etc., a pot of soup can be quietly simmering on the stove, waiting for you. It can be a snack while you get the rest of your dinner ready, or your dinner on its own. I like this one because it uses some of my favorite things; a trusty can of pumpkin, delicious spiced apple cider, Toasted Coconut Almondmilk and hot sauce. In a saucepan over medium heat, add olive oil and cook shallot until soft & fragrant. Add pumpkin, apple cider, coconut milk, cayenne, salt & pepper and whisk while heating. Be careful to keep the heat low. When it bubbles, you'll get tiny explosives leaping out of the pot. Actually, when that starts happening, its done! Taste and add more cayenne and/or hot sauce. Top with cream and toasted walnuts. Strong, German, about 10 inches long and sharp as hell. Following our wedding whirlwind, like most couples do, we began using our gift cards to feather our nest. It was so much fun and we were so grateful. In my mind, our $100 Williams Sonoma card was already spent. I had been dreaming (on-line shopping) about my perfect kitchen tool; the one that would make all the difference. That day, I was surprised to see that Pete was excited about shopping. He was expecting a shopping spree of high ball glasses, a blender and maybe a toaster! I said nothing. Long story short, we walked out 15 minutes later with a single item, My Knife. We were heavy with chopping anticipation and light by about $30 cash. I got home and immediately opened a bottle of wine and admired My Knife. It was so shiny, strong and beautiful. The chopping, slicing and dicing commenced. I chopped everything that I could find; tomatoes, lemons, onions, soda cans and then back to the juicy ripe tomatoes**... and then somehow, my own fingers. By the end of the night, a single little nick on my index finger turned into about a dozen tiny cuts all over my hands. Both hands somehow. The wine. The next day was Monday. Work. My boss and I were doing a mediation on a big case. Mediations involve sitting at a table with other lawyers, a retired judge usually, insurance people, etc. talking, advocating, negotiating, and more lawyer stuff. These are activities that, unfortunately can not be done with your hands hidden in a fur muff. That day, my "power suit" was accented by 10 or so tiny Band-Aids placed all over my fingers ala Michael Jackson from the "Leave Me Alone" video. My boss noticed so I put my hands up and shrugged "new knife." He said nothing. The hands went into my suit jacket pockets where they stayed for the day. This is likely the most awkward of all awkward positions, try it. Its ridiculous. But I didn't care. I had My Knife and I loved it despite the pain and embarrassment. I couldn't wait to get home to do more chopping. About nine years later and I'm still with My Knife. These days, I crush garlic cloves like an angry cave woman, slice cucumbers while singing and dancing and carve through giant roasts with ease- like butter! Over the years, My Knife has gradually taught me to respect its deadly sharpness, but has also made me the master of my kitchen. My point about My Knife (pun intended) is its not about the shop from where you found it. Its not the price tag. Its not its German-ness. Its value is in the way it makes you feel. The weight of a good knife in your hand, can transform you from a home cook to The Chef in your own home. Get one and fall in love. But, please be careful! What kitchen tool or gadget makes you feel like a Chef in your kitchen? This drink is a true favorite. Its easy to drink and goes with almost everything. Its effervescent, light and refreshing with a bit of sparkle. Stir, garnish with a little citrus and enjoy. And just like that, its summer! Scroll down, our last post is about cozy, rich French onion soup. What a difference a day (or two) makes! We've been revisiting our old friend, St~Germain by adding it to practically every drink we make. Its so versatile, but also special. Here, we're celebrating the promise of tropical weather- a little sunshine in a glass! Shake all ingredients with ice and pour into a chilled martini glass. Garnish with pineapple or lime slice. Feet up, deep breath, sip... & repeat! Tortilla soup and its yummy friends to garnish! Hello friends! It's been too long. I've been so buried since my company was acquired I can't tell what day of the week it is anymore! Needless to say, I've been shirking my responsibilities with posting. That said, if there's one thing that can pull me out of being buried with work, it's Cinco de Mayo! It's not a secret that I love all things Mexican; the country, the people, the food, the beaches, etc. 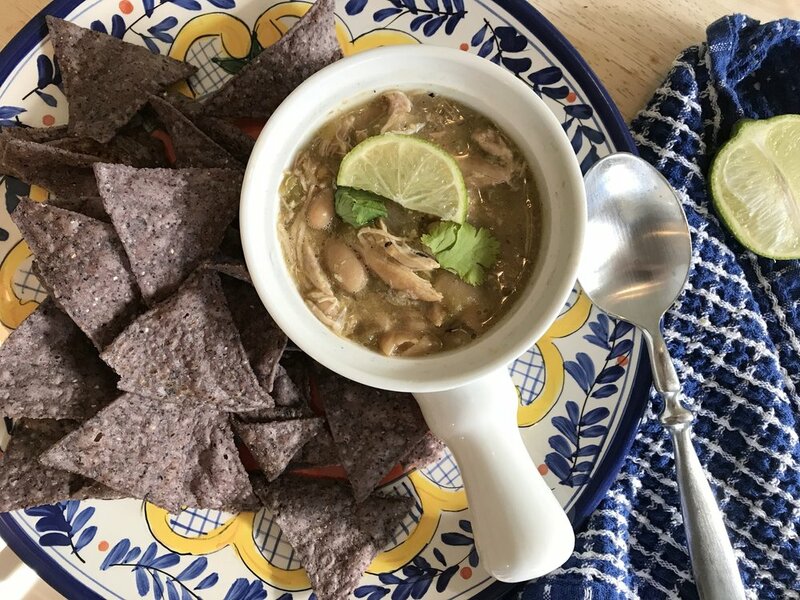 I've tried a million different versions of one of my most favorite Mexica Soups but, decided to share a new version for you on the big day! In order to ensure you got the very best version I also visited my favorite Mexican Grocery Store in Red Bank, NJ. I'm not sure what I love most about it but, I'm sure I love that everyone is speaking Spanish. My cart.... yes, there's more in there than just the ingredients for this soup! Sneak preview of more to come for Cinco de Mayo! The fun part is how easy this is. You can play with the recipe as much as you'd like. I threw all the ingredients (except the chicken broth) into my cast iron skillet whole, then cut them up one after the other and dumped them into a blender, yup - beyond easy! Fill a saucepan with the chicken broth and turn on the heat on the lowest setting just to warm it up, not to get it hot. In the other pan, the cast iron skillet toss in the garlic, plum tomatoes, the peppers, onion slices and the peppers! Once they're all a little brown take them out and put them aside. once at a time, up to 4, pop those beautiful corn tortillas into the pan, it's dry still so, let them stay in there cozy for say 1 minute on each side. When those 4 are toasty, slide up the tomatoes and toss them back in the pan. Next step is super easy. First cut the tops off the peppers and dump out the seeds, sliced them up into a few pieces. Then, take everything else you just cooked, including the tortillas and throw them into your blender with say, 2 cups of chicken both (Note! the chicken broth shouldn't be hot or it may explode when you cover it and blend it - make sure - if it's steaming, do not blend it until it cools) Blend everything until smooth and add in your spices; cumin, garlic powder, salt pepper and pour it back into the chicken broth . Turn heat up to medium high. In a little bowl mix your corn starch and water, pour slowly into the warmed up soup and watch while it thickens. While it warms slice up your garnishes and get ready to eat a yummy treat! Slice the avocado, sprinkle with lime juice, cut off about a 1/2 cup of Queso fresco and crumble it up, as much cilantro as you like and the tortilla strips! The strips.... slice up the 4 remaining tortillas into strips. In a shallow frying pan you'll need to put canola oil in about 1/4 deep. When you drop the strips in, they'll fry fast so, stay over them with your tongs. As they brown, take them out and let them dry on a paper towel - sprinkle with salt. As you pour the soup into bowls and garnish with this yumminess ( fresco, tortillas, avocado and cilantro ) get ready to love this soup! Looks like a lot but, it's really easy and very fast. Don't shy away! I know you'll love this.